This is a beautiful park and an inviting walk for the visitor. Since colonial times, it has been located in the quarters known as the 7 Sisters Estate, which takes in all of the hills between Viña and Valparaíso and which belonged to the Carrera family, relatives of the national heroes. The well-to-do Portuguese businessman, Francisco Álvarez, who owned ships in Valparaíso, purchased the estate around 1840 and set up residence there. His wife, Dolores Pérez, was a great plant lover and she initiated the creation of the magnificent garden. Their son and wealthy heir, Salvador Álvarez, engaged in sailing expeditions to the Far East and Australia and brought back exotic plants which were incorporated into the garden. Don Salvador’s daughter, Mercedes, was living with her grandmother in la Quinta Vergara when the railway group, led by the contractor Mr. Paddison, arrived in1854. The 20 year old, engineering assistant, José Francisco Vergara, married Mercedes Álvarez, the wealthy and sole heiress of the entire estate. José Francisco Vergara set up the Viña del Mar Foundation in1874, selling land adjacent to the train line. In 1906 Doña Blanca Vergara de Errázuriz commissioned the arquitect Ettore Petri to build the Vergara Palace, in the Venetian style. Nowadays it houses the interesting Municipal Museum of Fine Art which exhibits a collection of the palace’s original paintings, as well as art works donated by collectors from Viña del Mar. Inside the building you will find the open air amphitheatre where the Viña del Mar International Song Festival has been held for the last 44 years. In 2002 it was completely remodeled with the latest computerised technology. The Quinta Vergara Park is situated in Errázuriz Street 596. Contact numbers are: 2269425, 2269426, 2738436, 2738438, 2738440. Visiting times are 07:00 to 18:00. The Flower Clock structure consists of a solid tunnel made of reinforced concrete, which leads to a machine room (in the shape of a clock). It is a Swiss design, by D’Harloges, and has one standard H-14 clock. Its mechanism operates by an electric control point which employs weights facilitating the regulation of the time. The long and short hands and the minute hand are made of bronze and each one is slightly more than 3 metres long. 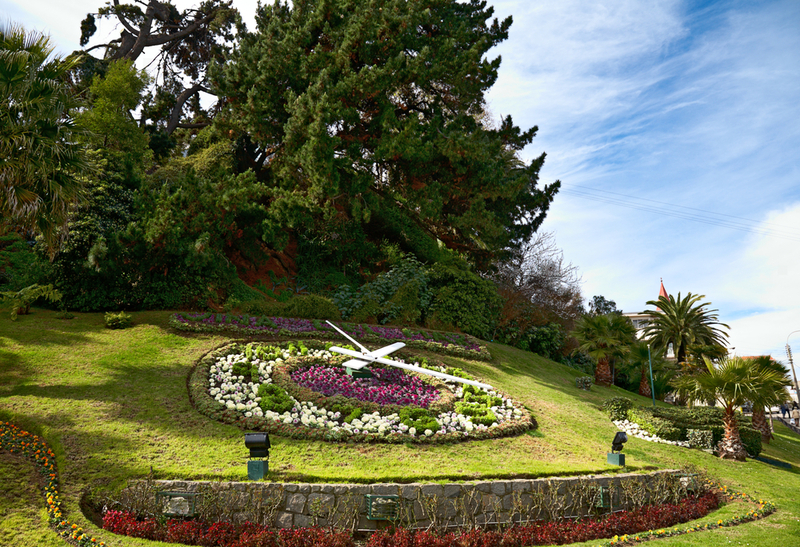 The Viña del Mar Flower Clock was brought over to Chile from Switzerland. It was inaugurated on15th May in 1962, the same day the opening ceremony the Football World Cup was held in Chile and Viña del Mar was one of the main host stadiums. The flowers receive constant maintenance and are changed every 3 months. They can not grow higher that 10cm because they would interfere with the movement of the clock hands. The design has not undergone any significant modifications, just a few improvements. It was founded on1st February in1999 and is a spacious park and forest which was planted in the 1930’s on a small valley surrounded by hills. The park spans a wide, internal circuit, beginning with a long circular walkway, surrounded by magnificent, vegetation, which then enters a beautiful avenue bursting with red and yellow hues in autumn. It continues on as a lawn lined with imposing trees and a palm grove until it reaches a large lagoon with a beautiful pedestrian walkway which becomes a path leading through the forest. The path back through the forest crosses over to the other side of the river where you can find a pretty picnic area. You can also enjoy the Cactario which is a fabulous collection of Chilean cactus where you have access to tables, picnic and barbeque areas. The park was built for personal use by Don Pascual Baburizza, a famous saltpeter manufacturer, who planted many of the beautiful big trees still seen nowadays in the park. It includes over 3 000 species of incredibly beautiful, well bred vegetation, as well as others that are of utmost botanical value. It is located in Camino El Olivar in the district of El Salto. The contact number is 672566. You can visit it any day from10:00 to 18:30 and an entrance fee is charged.